Home / Posts Tagged "computer spy"
A national nonprofit focusing on digital privacy rights has raised questions about computer software distributed to families by the Pinellas County Sheriff’s Office. ComputerCOP, a program designed to monitor children’s Internet use, has claimed endorsements that are questionable at best, according to the Electronic Frontier Foundation. Among them: the U.S. Treasury. “This is all false accusations,” said Stephen DelGiorno, ComputerCOP president. Marketing materials obtained by the EFF show ComputerCOP also claimed endorsements from the American Civil Liberties Union and the National Center for Missing & Exploited Children. An ACLU spokesman told the Tampa Bay Times that the nonprofit never endorsed ComputerCOP. DelGiorno explained that in a 2004 newspaper article about the software, an ACLU spokesperson said the organization encouraged parents to monitor their children online. A spokeswoman with the missing children center said the agency had an agreement with ComputerCOP in 1998, but it expired years ago. The marketing materials also include a letter from the U.S. Treasury to a sheriff’s department granting permission to use forfeiture funds to buy ComputerCOP. A letter by DelGiorno stated that the product was “approved” by the Treasury, which has listed ComputerCOP on its fraud alert Web page. DelGiorno said he contacted the Treasury to have the alert removed. He sent a Times reporter a copy of what he said were ComputerCOP’s current marketing materials, which did not include any of the endorsements. It was unclear when they were removed. According to the EFF, ComputerCOP has been sold to about 250 agencies nationwide in the past decade. Among them are several in Florida, including the Hillsborough County Sheriff’s Office, which stopped distributing the program last year after encountering “virus-related issues,” a spokeswoman said. Gualtieri said he based his decision to purchase ComputerCOP on referrals from other agencies and did not know at the time about the endorsements. The EFF report, released in October, also claims that one of the software’s features can make it easier for hackers to access personal informa­tion. “This is a major issue and we verified it many times over,” said Dave Maass, the EFF researcher who completed the report. DelGiorno said the EFF’s claims are not true, but some agencies have notified parents about the potential privacy concerns. The Pinellas Sheriff’s Office vetted the nonprofit’s report and agreed the hacking concerns had “some merit,” Gualtieri said. After buying 5,000 copies for $26,500, the Sheriff’s Office began distributing the software for free last month with a letter explaining the possible risks. Roughly 1,000 copies have been picked upm and the sheriff said he has received only positive feedback. “We let people know in full disclosure what the potential issue was,” Gualtieri said. Are your employees spending too much time on chatting when working?Here SurveilStar Any Employee Monitor can remotely monitor Instant Messenger chats and automatically record chattings on ICQ, MSN Messenger, Yahoo, Skype, and Google Talk. Instant messaging is real-time communication. It’s a blend of e-mail and chat (since you send one to someone and get real-time communication), but better. It’s also fast eclipsing e-mail as the most popular Internet communication tool. Instant messaging is much faster than the other ways of internet messaging like e-mails and proffers instant gratification to the user. Nowadays, instant messaging is a popular way of social interactions. Answering e-mails is time-consuming and it does not indicate whether the person you want to communicate with, is online or not. Instant messaging not only saves time and money, but also enables faster messaging and also maintains the natural flow of conversation. Instant messaging is one of the best ways available on the internet, for staying in touch with relatives and friends. Are employees killing time on chatting? How much time have employees spent on chatting? As a manager, you have to keep yourself informed of what employees are doing on the internet, do they express any opinion about you and the company for a better management or they even say something bad about the company. Start to know more about your employees by using Any Employee Monitor. The benefits of IMs are many. With this tool you can chat and communicate with anybody anywhere for free. Some Internet messengers even give you the option to call, if you have a microphone and speaker, or see the person you are calling or chatting with real-time, if you have a web cam. However, these advanced features and functions may lead to inefficient outcomes for a company, since employees might take advantage of your absence and chating on line. Any Employee Monitor help to keep you informed of what employee did while you were away, recording chattings, online activities and etc. * Monitoring and recording the activities of instant messenger such as MSN, ICQ and etc. remotely. * Easy to use, quick live support. * Hidden to user, Undetectable to anti-virus and anti-spyware. * Monitoring internet usage with detailed reports. * Presenting a statistic on pages visited, time and length of visit, the application usage. * Take screen snapshots in real time. * Monitor and record sent & received email. * Monitor the websites visited and block the unwanted websites. 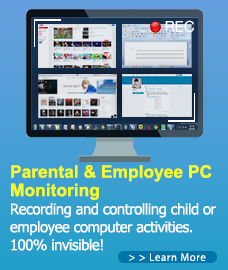 SurveilStar Any Employee Monitor is the Best Instant Messaging Monitoring Software for parents to monitor and record IM chats such as Skype, ICQ, MSN Messenger, Yahoo, and Google Talk etc. SurveilStar any employee monitor is such a wonderful program. I love it! Suspect your partner might be having an affair? Want to find out if he/she is telling the truth or has a need to discover details of the affair? Do you know that there are some stunning tricks using which you can spot a cheating spouse within seconds? These ways are so effective that they are guaranteed to reveal the truth and end all the lies within seconds…..You can’t afford to miss this at any cost. SurveilStar Spy Software is a surveillance tool which allows you to secretly monitor and record user’s activities on computer, and it is completely legal. Our SurveilStar Spy Software is the best solution! With this easy to use spy software, you will be able to see exactly what your spouse has been doing online and off-line just like you are looking at the computer monitor over his/her shoulder! It allows you to record keystrokes, e-mails, online conversation, password, Web site, and take screen snapshots at intervals like a surveillance camera, and deliver spy logs to you via E-mail or FTP at set intervals. SurveilStar is 100% invisible to your wife, husband, girlfriend, boyfriend, or loved one. SurveilStar cheating spy software doesn’t appear in the Registry, the Process List, the System Tray, the Task Manager, on the Desktop, or in Add/Remove programs. There aren’t even any visible files that can be seen! If you suspect a cheating spouse, then statistics state that you are probably correct. Among other types of technology, cell phones is the main tool used by cheating husbands to contact their dates, send sweet nothings or arrange “special” rendezvous. Whether by SMS or actual phone calls, the majority of extramarital exchanges will be made using the mobile phone not the Internet or Email. The cell phone is a cheater’s best friend. With cell phone spy software, you can remotely monitor actions on your phone if you have the proper permission of the monitored party. It discreetly creates its own logs for call and text message activities performed on your phone. These logs are uploaded to your account. So that you can spy on a cheating spouse’s mobile phone and read the text messages on their mobile phone. You can also get information about the calls made by and received by your spouse if you don’t trust him or her.